**Hot on the heels of her 'Folkways II' cassette mix for Trilogy Tapes, Beatrice Dillon does a dubbed-out "mutant shuffle" somewhere between Joe and Madalyn Merkey. Edition of 50 housed in two-colour risograph sleeves printed in recycled paper stock** "Where To Now? 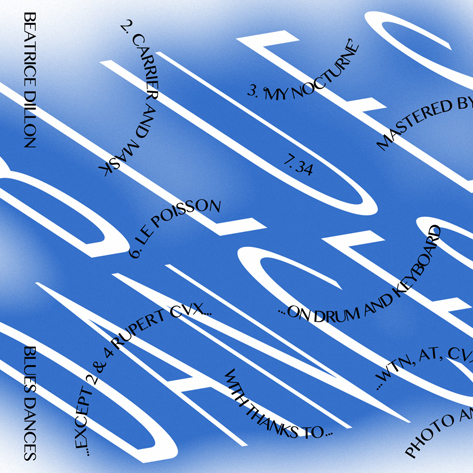 Are proud to present 'Blues Dances', a 30 minute exploration of sound and style which serve as a precursor to a forthcoming 12” and full length LP landing with us in early 2015. Beatrice's music although primarily electronic and sample based does not exist solely or comfortably within this world, there's an understated, tangible, and often playful quality to her creations that find her in a field of her own. Her music strikes a unique balance - the sound is impeccably and carefully considered, precise, and emotionally weighted, whilst at the same time managing to assume an air of complete freedom and full blown experimentation. Beatrice's interest appears to lay within this meeting of the synthetic and the tangible, there's a hand made quality throughout 'Blues Dances' where computerised, dubbed out percussion and samples meld with guitars, wah tubes, bass, pianet, and the real percussive world of snare drum experimentations and rhythmic balafon, an interest further evidenced throughout Beatrice's other forthcoming compositional percussive endeavors. A favoured phrase of Where To Now? Records - 'Mutant Shuffle' has never felt so at home as it does with this work, to imply that a creation has intent to move bodies via a feeling that is both at home and knowing whilst being completely fresh, exciting, and other is an implication that Beatrice has nailed. This is the sound of early On-U Sound creators such as African Head Charge and soundscape artists such as GAS filtered through modern dancefloor experimenters like Ricardo Villalobos and Max Loderbauer, Joe, Basic Channel, Pearson Sound etc."